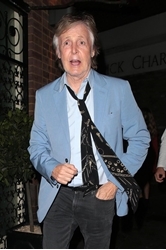 Sir Paul McCartney has dreams The Beatles reunite – but the gigs always end in disaster . Beatles Radio: The Beatles, Solos, Covers, Birthdays, News The Fab 4 and More! ROCKER Sir Paul McCartney has dreams of a Beatles reunion - but admits the fantasy gigs always end up in disaster. The music legend, 76, says he often fantasises about reuniting onstage with Ringo Starr and the late John Lennon and George Harrison, although the performances never go to plan. He said: “We’re playing a dreadful gig somewhere, and the audience are walking out. That happens a lot.